I've participated in promoting these giveaways in the past and they've always been very popular. 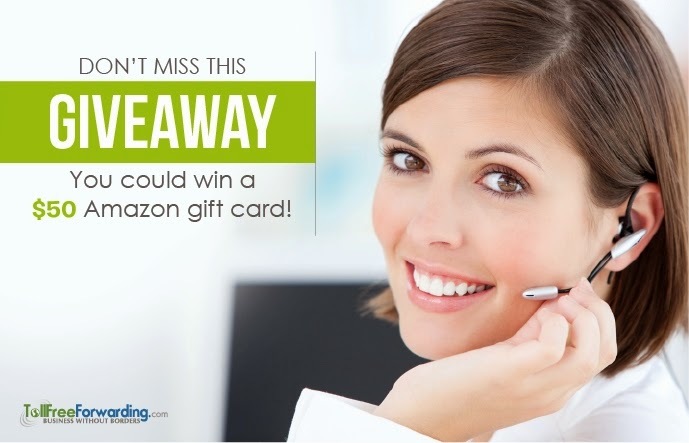 Here's your chance to win a $50 Amazon Gift Card/Code thanks to the folks at Toll Free Forwarding. It runs through 8/6 and is open to US and CA residents who are 18+. Void where prohibited. If you didn't have bills to pay, what would you do with the money were you to win? Give it away? Go on a trip? Give it to me? Burn it? As mentioned above, the $50 Amazon gift code giveaway is open to US/CA residents who are 18+ and runs through 8/6 at 11:59 pm EDT. Disclosure: Java John Z's is not responsible for sponsor prize shipment. Please see the disclosure policy for more information. I would use it to fill up my gas tank. I would get my husband a couple of new colorful summer shirts! He needs more color in his wardrobe! I have a long wish list on Amazon, so I'd be able to cut into that list a bit if I'm lucky enough to win this. I can always use new dog collars and leashes (I have five rescued Treeing Walker Coonhounds and they are rough on their collars). I also have several DVD's on my wish list I could pick up. If I win, I would put the $50 towards more memory for my computer. I keep getting messages saying I have run out of memory and my computer has 8 GB of memory so I need to increase it to 16 GB of memory for now. I would use it to buy craft supplies. If I win, I will put it toward my son's birthday which is coming up soon. If I were to win this TollfreeForwarding giveaway, I would use the $50 Amazon gift card towards purchasing a DVD player in my husband's Amazon wish list for Christmas! I would buy some textbooks (or help offset the cost of college textbooks). I do not know exactly at this moment just what I would buy... probably end up mail-ordering some things I cannot get at any stores near me.. like "Wet n forget" LOL I love that stuff.... and from time to time, Birthday gifts the out of town kids tell me they want.. I would purchase a couple pairs of jeans. i would put the gift card towards the donut maker i've had my eye on. I would probably spend it on a baby gate. We need one in the next few weeks! I'd buy some clothes if I won! Or maybe a new pair of running shoes. I would buy a scratching pole for my cat! I would spend the $50 amazon gift card to purchase a pair of sneakers. I can get them for 60%+ less through amazon! I would put it towards a birthday gift for my sister. Its boring but I would buy new bed pillows. Hi! If I were to win, I would get some things I need and want for my new apartment. Nice! Thank-you!! I would buy several books that are on my wish list. I just got a new lab puppy. I would buy more food for him and treats. I'd put it towards a new pair of shoes. I would probably be selfish and pick up some books and ebooks from my wish list, as I have over 500 on there right now! I would buy stuff for my new baby girl. I have really been wanting to get her a Baltic Amber Teething Necklace and a WubbaNub, for example.